Bến Tre ([ˀɓən˦ˀ˥ ʈɛ˧˥] listen) is the capital city of Bến Tre Province, in the Mekong Delta area of southern Vietnam. The city covers an area of 65.75 km2 (25.39 sq mi) and has a population of 143,639 as of 2009. Bến Tre is 85 kilometres (53 mi) south-east of Ho Chi Minh City and is connected to the surrounding provinces by the Rạch Miễu Bridge. Nearly destroyed by Allied bombing, it played a significant role in the Vietnam War. Reports of the assault and resulting civilian casualties called into question the war aims of the United States. North and east by districts of Châu Thành. South by districts of Giồng Trôm. Hàm Luông River in the west, separating the city from the districts of Mỏ Cày Bắc. The city of Bến Tre has 10 wards: 1, 2, 3, 4, 5, 6, 7, 8, Phú Khương, Phú Tân and 7 communes of Bình Phú, Mỹ Thành, Mỹ Thạnh An, Nhơn Thạnh, Phú Hưng, Phú Nhuận and Sơn Đông. The French occupied Bến Tre in 1867. ^ Thạch Phương, Tứ Đoàn, Phương Thảo Nguyễn Địa chí Bến Tre 1991 "Only in Bao and Minh islets, there had been 70 schools of Chinese characters in 152 villages until the French occupied Ben Tre (1867). That was a very rare proportion at that time. The list of the Ben Tre successful candidates written in the...."
Ba Tri is a rural district (huyện) of Bến Tre Province in the Mekong Delta region of Vietnam. As of 2004 the district had a population of 201,802. The district covers an area of 351 km². The district capital lies at Ba Tri.The district is in the east of Bến Tre Province. It is bordered to the east by the South China Sea, to the north by the Ba Lai River, to the south by the Hàm Luông river. To the west is Giồng Trôm District. In the capital of Ba Tri lies the final resting place of the famed 19th-century poet Nguyễn Đình Chiểu, known for his patriotic anti-colonial writings. It has been visited by dignitaries including Nông Đức Mạnh. The commune of Bảo Thạnh is the home of Phan Thanh Giản, a leading mandarin of Tự Đức who was also the first southerner to gain a PhD in the imperial court examinations. The commune of Bảo Thuận among others is known for tourism. Bánh bía, sometimes spelled bánh pía, is a type of Vietnamese cuisine bánh (translates loosely as "cake" or "bread"). A Suzhou style mooncake adapted from Teochew cuisine. The Vietnamese name comes from the Teochew word for pastry, "pia". In Saigon, the pastry is called “bánh bía” while in Sóc Trăng and Vũng Thơm it is known by "bánh Pía". Some Vietnamese call it bánh lột da, which translates to "peeling flakes pastry", and those from the Bến Tre region call it bánh bao chi, which is the name for Mochi elsewhere in Vietnam. Popular fillings include durian, shredded pork fat, salted egg yolk, mung bean paste, taro and coconut. Bình Đại is a rural district of Bến Tre Province in the Mekong Delta region of Vietnam. As of 2003 the district had a population of 131,813, growing from 129,446 in 2001. The district covers an area of 381 km². The district capital lies at Bình Đại. 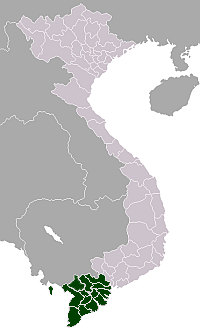 Bến Tre (listen) is a province of Vietnam. It is one of the country's southern provinces, being situated in the Mekong Delta. The Bến Tre River (Vietnamese: Sông Bến Tre) is a river of Vietnam. It flows for 30 kilometres through Bến Tre Province. Châu Thành is a rural district of Bến Tre Province in the Mekong Delta of Vietnam. As of 2003 the district had a population of 167,472. The district covers an area of 229 km². The district capital lies at Châu Thành.The district lies to the north of Bến Tre Province, the Tiên River, the towns of Bến Tre and Mỹ Tho and the districts of Châu Thành and Cai Lậy in Tiền Giang Province. To the south is the Hàm Luông River and the Chợ Lách and Mỏ Cày districts. Chợ Lách is a rural district (huyện) of Bến Tre Province in the Mekong Delta region of Vietnam. As of 2003 the district had a population of 134,584. The district covers an area of 189 km2. The district capital lies at Chợ Lách. The district capital lies on Provincial Highway 57 and is 45 km west of Bến Tre and 20 km east of Vĩnh Long. The district capital was formed by Decree No. 41/HĐBT on March 14, 1984 by the Vietnamese Cabinet. The capital comprises the following hamlets: Sơn Quy, 2/3 Bình An, 1/6 Phụng Châu of the commune of Sơn Định. Chợ Lách's name means "Lách Market", and is derived from the presence of a market in the area in the vicinity of many "lau lách" trees. Giồng Trôm is a rural district of Bến Tre Province in the Mekong Delta region of Vietnam. As of 2003 the district had a population of 186,719. The district covers an area of 311 km2. The district capital lies at Giồng Trôm. This district is the home country of Phan Văn Trị. The commune Mỹ Thạnh has the famous speciality: Mỹ Lồng rice paper. The district includes Phước Long, Giồng Trôm. The Hàm Luông River (Vietnamese: Sông Hàm Luông) is branch of Mekong River in the Mekong Delta region, Vietnam. It flows for 70 kilometres (43 mi) through Bến Tre Province. It is the border of Châu Thành, Bến Tre, Giồng Trôm and Ba Tri, and Chợ Lách, Mỏ Cày Nam, Mỏ Cày Bắc and Thạnh Phú. Hòa Lộc is a commune of Mỏ Cày Bắc District, Bến Tre Province, Vietnam. The commune covers 13.32 km2. In 1999 it had a population of 9,159 and a population density of 688 inhabitants/km2. Mỏ Cày Bắc is a rural district (huyện) of Bến Tre Province in the Mekong Delta of Vietnam. The district is established in March 2009. Mỏ Cày Bắc is bordering Mỏ Cày Nam and Giồng Trôm districts on the east; Chợ Lách District on the west; Vĩnh Long Province in the south; Châu Thành District and Bến Tre town in the north. Mỏ Cày Bắc has a population of 138,570 and covers an area of 154.6 km2. The district is subdivided into 13 communes (xã): Thanh Tân, Thạnh Ngãi, Tân Phú Tây, Tân Thành Bình, Thành An, Phước Mỹ Trung, Tân Thanh Tây, Tân Bình, Nhuận Phú Tân, Hòa Lộc, Khánh Thạnh Tân, Hưng Khánh Trung A và Phú Mỹ. Mỏ Cày Nam is a rural district (huyện) of Bến Tre Province in the Mekong Delta of Vietnam. The district is established on March 2009. Mỏ Cày Nam is bordering with Giồng Trôm District on east, Trà Vinh Province on the west, Mỏ Cày Bắc and Giồng Trôm districts on the north and northeast; Thạnh Phú District and Trà Vinh Province on the south and southwest. Mỏ Cày Nam has a population of 186,474 and covers an area of 219.9 km2. This district is subdivided into 1 township (thị trấn) and 16 communes (xã). Communes: Định Thuỷ, Phước Hiệp, An Thạnh, Đa Phước Hội, Thành Thới B, Bình Khánh Đông, Bình Khánh Tây, An Định, An Thới, Thành Thới A, Hương Mỹ, Cẩm Sơn, Ngãi Đăng, Minh Đức, Tân Trung, Tân Hội. Nguyễn Thị Kim Ngân (born 12 April 1954 in Bến Tre Province) is a Vietnamese politician who is presently Chairwoman of the National Assembly of Vietnam. She is a member of the 12th Politburo of the Communist Party of Vietnam, in which she is ranked second, after General Secretary of the Communist Party Nguyễn Phú Trọng. She previously served as Deputy Chairwoman of the National Assembly of Vietnam. She became the Chairwoman of the National Assembly of Vietnam on 31 March 2016, replacing Nguyen Sinh Hung. Phú Mỹ is a rural commune of Mỏ Cày Bắc District, Bến Tre Province, Vietnam. a commune covers 7.13 km2. In 1999 it had a population of 6,132 and a population density of 860 inhabitants/km2. Thanh Tân is a rural commune of Mỏ Cày Bắc District, Bến Tre Province, Vietnam. The commune covers 20.24 km2. In 1999 it had a population of 11,051 and a population density of 546 inhabitants/km2. Thành An is a rural commune of Mỏ Cày Bắc District, Bến Tre Province, Vietnam. The commune covers 11.32 km2. In 1999 it had a population of 8,106 and a population density of 716 inhabitants/km2. Thạnh Phú is commune-level town and capital of Thạnh Phú District in Bến Tre Province in the Mekong Delta region of Vietnam. As of 1999 it has 10,331 citizens and covers an area of 11.39 km². Thạnh Phú is a rural district of Bến Tre Province in the Mekong Delta region of Vietnam. As of 2003 the district had a population of 131,964. The district covers an area of 401 km². The district capital lies at Thạnh Phú.The district is in the southeast of the province. To the north is the Hàm Luông River and Ba Tri District, to the south is the Chiên River and Trà Vinh Province. To the west is Mỏ Cày District, to the east is the South China Sea. The district capital is on National Highway 57 and is around 45 km southeast of Bến Tre. Tân Bình is a rural commune (xã) of Mỏ Cày Bắc District, Bến Tre Province, Mekong Delta region of Vietnam. The commune covers 9.94 km2, with a population of 8493 (2009), and a population density of 854 inhabitants/km2.